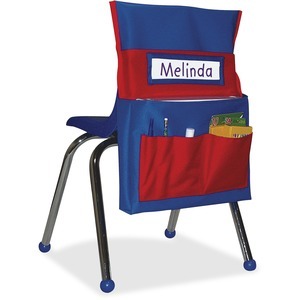 The chairback pocket chart is the perfect solution for your classroom storage needs. Storage pockets provide an easy way to keep children's supplies organized and always within reach. Small clear pocket provides a convenient pocket for displaying name tags. Heavy-duty, washable canvas features a PVC coating for added durability. Chairback pocket chart is designed for students in preschool through eighth-grade.